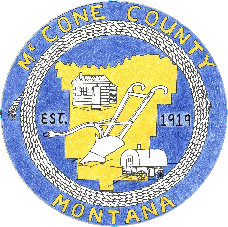 The McCone County Treasurer’s Office seeks to provide quality services to the taxpayers of McCone County with integrity, fiscal accountability and positive leadership through encouraging public participation, communication, collaboration and innovation in working to build a strong community. Vehicle renewals can be done at the County Treasurer’s office between the hours of 8 am and 5 pm by check, cash or credit card, by mail renewal or on the new Merlin Online Renewal system. To renew with the Merlin Online Renewal system have your renewal card or registration available. Tabs and registration receipts will be mailed the following day after correct payment has been received. Mail Renewal: Send reminder card from State of MT or registration and $1 per registration mailing fee. Due to the new Montana State Motor Vehicle computer system, if you come in to the office with paperwork please be prepared to wait. No title paperwork will be done after 4:30 pm during this transition. Thank you in advance for your patience through this conversion process. New residents may use a valid driver’s license and vehicle registration from their former state for up to 30 days. It is unlawful to operate a motor in the State of Montana without valid vehicle liability insurance, certificate of self-insurance or posted indemnity. The County Treasurer will issue standard plates to all vehicle owners unless they request other plates. Montana registered trucks and passenger cars must display a license plate on the front and rear of the vehicle with the renewal tab on the rear plate. We accept credit card payments through:www.officialpayments.com. Payments can be made by accessing the Official Payments website, at the Treasurer’s office and by phone. Property tax bills are mailed in October of each year to the owner of record, as their name and mailing address appears on the tax roll. The tax roll is prepared and maintained by the State of Montana, Department of Revenue, Assessor’s Office. If you have not received a tax statement by November 1st, please contact the Treasurer’s Office at 406-485-3590 to request a duplicate statement or to request an address change. Taxes on real estate may be paid in two installments, the first installment on or before November 30th of each year, the second installment on or before May 31st of the following year. If the first installment is not paid or postmarked on or before November 30th then the amount of this FIRST INSTALLMENT ONLY becomes delinquent. If the second installment is not paid or postmarked on or before May 31st, then the amount of this SECOND INSTALLMENT ONLY becomes delinquent. When either installment becomes delinquent a penalty of 2% will be immediately added, together with interest at the rate of 10% per annum, until paid. BOTH INSTALLMENTS MAY BE PAID AT ONE TIME, on or before November 30th, if so desired. Your property may qualify for Property Tax Assistance Program, this may include: Property Tax Assistance Disable or Deceased Veteran’s Residential Exemption, the Extended Property Tax Assistance Program and/or Elderly Homeowner’s Tax Credit. Contact the Montana Department of Revenue at 406-485-3565 for further information. • Due within 30 days after the notice is mailed. Taxes on personal property are paid in one payment. The treasurer must within 30 days after the notice is mailed to the taxpayer, collect same by seizure and sale of property if tax is not paid. If not paid within 30 days the tax becomes delinquent and a 2% penalty and 10% interest per annum must be added. If not paid or postmarked by 5 pm on the due date the tax becomes delinquent and a 2% penalty and 10% interest per annum must be added. Drivers License - The Drivers License Examiner is in Circle the 2nd Thursday of every month. Hours are 9:30 am to 2:30 pm located in the Courthouse. You must pay your fees prior to seeing the Drivers Examiner at the McCone County Treasurer’s office and make sure you have all the required documents. Please check out the Driving in Montana website listed below if you are a new driver or new to Montana driver for required documents.